Hovercraft use blowers to produce a large volume of air below the hull that is slightly above atmospheric pressure. The pressure difference between the higher pressure air below the hull and lower pressure ambient air above it produces lift, which causes the hull to float above the running surface. For stability reasons, the air is typically blown through slots or holes around the outside of a disk- or oval-shaped platform, giving most hovercraft a characteristic rounded-rectangle shape. Typically this cushion is contained within a flexible “skirt”, which allows the vehicle to travel over small obstructions without damage. The first practical design for hovercraft was derived from a British invention in the 1950s to 1960s. They are now used throughout the world as specialised transports in disaster relief, coastguard, military and survey applications, as well as for sport or passenger service. Very large versions have been used to transport hundreds of people and vehicles across the English Channel, whilst others have military applications used to transport tanks, soldiers and large equipment in hostile environments and terrain. Although now a generic term for the type of craft, the name Hovercraft itself was a trademark owned by Saunders-Roe (later British Hovercraft Corporation (BHC), then Westland), hence other manufacturers’ use of alternative names to describe the vehicles. There have been many attempts to understand the principles of high air pressure below hulls and wings. To a great extent, the majority of these can be termed “ground effect” or “water effect” vehicles rather than hovercraft. The principal difference is that a hovercraft can lift itself while still, whereas the majority of other designs require forward motion to create lift. These active-motion “surface effect vehicles” are known in specific cases as ekranoplan and hydrofoils. In 1931, Finnish aero engineer Toivo J. Kaario began designing a developed version of a vessel using an air cushion and built a prototype Pintaliitäjä (Surface Soarer), in 1937. Kaario’s design included the modern features of a lift engine blowing air into a flexible envelope for lift. Kaario never received funding to build his design, however. Kaario’s efforts were followed closely in the Soviet Union by Vladimir Levkov, who returned to the solid-sided design of the Versuchsgleitboot. Levkov designed and built a number of similar craft during the 1930s, and his L-5 fast-attack boat reached 70 knots (130 km/h) in testing. However, the start of World War II put an end to Levkov’s development work. The idea of the modern hovercraft is most often associated with a British mechanical engineer Sir Christopher Cockerell. Cockerell’s group was the first to develop the use of an annular ring of air for maintaining the cushion, the first to develop a successful skirt, and the first to demonstrate a practical vehicle in continued use. Cockerell came across the key concept in his design when studying the ring of airflow when high-pressure air was blown into the annular area between two concentric tin cans, one coffee and the other from cat food and a hair dryer. This produced a ring of airflow, as expected, but he noticed an unexpected benefit as well; the sheet of fast moving air presented a sort of physical barrier to the air on either side of it. This effect, which he called the “momentum curtain”, could be used to trap high-pressure air in the area inside the curtain, producing a high-pressure plenum that earlier examples had to build up with considerably more airflow. In theory, only a small amount of active airflow would be needed to create lift and much less than a design that relied only on the momentum of the air to provide lift, like a helicopter. In terms of power, a hovercraft would only need between one quarter to one half of the power required by a helicopter. This lack of military interest meant that there was no reason to keep the concept secret, and it was declassified. Cockerell was finally able to convince the National Research Development Corporation to fund development of a full-scale model. In 1958, the NRDC placed a contract with Saunders-Roe for the development of what would become the SR.N1, short for “Saunders-Roe, Nautical 1”. The SR.N1 was powered by a 450 hp Alvis Leonides engine powering a vertical fan in the middle of the craft. In addition to providing the lift air, a portion of the airflow was bled off into two channels on either side of the craft, which could be directed to provide thrust. In normal operation this extra airflow was directed rearward for forward thrust, and blew over two large vertical rudders that provided directional control. For low-speed maneuverability, the extra thrust could be directed fore or aft, differentially for rotation. The SR.N1 made its first hover on 11 June 1959, and made its famed successful crossing of the English Channel on 25 July 1959. In December 1959, the Duke of Edinburgh visited Saunders-Roe at East Cowes and persuaded the chief test-pilot, Commander Peter Lamb, to allow him to take over the SR.N1’s controls. He flew the SR.N1 so fast that he was asked to slow down a little. On examination of the craft afterwards, it was found that she had been dished in the bow due to excessive speed, damage that was never allowed to be repaired, and was from then on affectionately referred to as the ‘Royal Dent’. Latimer-Needham and Cockerell devised a 4 feet (1.2 m) high skirt design, which was fitted to the SR.N1 to produce the Mk V,displaying hugely improved performance, with the ability to climb over obstacles almost as high as the skirt. 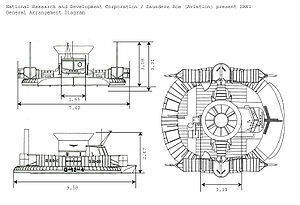 In October 1961, Latimer-Needham sold his skirt patents to Westland, who had recently taken over Saunders Roe’s interest in the hovercraft. Experiments with the skirt design demonstrated a problem; it was originally expected that pressure applied to the outside of the skirt would bend it inward, and the now-displaced airflow would cause it to pop back out. What actually happened is that the slight narrowing of the distance between the walls resulted in less airflow, which in turn led to more air loss under that section of the skirt. The fuselage above this area would drop due to the loss of lift at that point, and this led to further pressure on the skirt. After considerable experimentation, Denys Bliss at Hovercraft Development Ltd. found the solution to this problem. Instead of using two separate rubber sheets to form the skirt, a single sheet of rubber was bent into a U shape to provide both sides, with slots cut into the bottom of the U forming the annular vent. When deforming pressure was applied to the outside of this design, air pressure in the rest of the skirt forced the inner wall to move in as well, keeping the channel open. Although there was some deformation of the curtain, the airflow within the skirt was maintained and the lift remained relatively steady. Over time, this design evolved into individual extensions over the bottom of the slots in the skirt, known as “fingers”. Another major pioneering effort of the early hovercraft era was carried out by Jean Bertin‘s firm in France. Bertin was an advocate of the “multi-skirt” approach, which used a number of smaller cylindrical skirts instead of one large one in order to avoid the problems noted above. During the early 1960s he developed a series of prototype designs, which he called “terraplanes” if they were aimed for land use, and “naviplanes” for water. The best known of these designs was the N500 Naviplane, built for Seaspeed by the Société d’Etude et de Développement des Aéroglisseurs Marins (SEDAM). The N500 could carry 400 passengers, 55 cars and five buses. It set a speed record between Boulogne and Dover of 74 kn (137 km/h). It was rejected by its operators, who claimed that it was unreliable. Another discovery was that the total amount of air needed to lift the craft was a function of the roughness of the surface it traveled over. On flat surfaces, like pavement, the needed air pressure was so low that hovercraft were able to compete in energy terms with conventional systems like steel wheels. However, as the hovercraft lift system acted as both a lift and very effective suspension, it naturally lent itself to high-speed use where conventional suspension systems were considered too complex. This led to a variety of “hovertrain” proposals during the 1960s, including England’s Tracked Hovercraft and France’s Aérotrain. In the U.S., Rohr Inc. and Garrett both took out licenses to develop local versions of the Aérotrain. These designs competed with maglev systems in the high-speed arena, where their primary advantage was the very “low tech” tracks they needed. On the downside, the air blowing dirt and trash out from under the trains presented a unique problem in stations, and interest in them waned in the 1970s. Hovercraft can be powered by one or more engines. Small craft, such as the SR.N6, usually have one engine with the drive split through a gearbox. On vehicles with several engines, one usually drives the fan (or impeller), which is responsible for lifting the vehicle by forcing high pressure air under the craft. The air inflates the “skirt” under the vehicle, causing it to rise above the surface. Additional engines provide thrust in order to propel the craft. Some hovercraft use ducting to allow one engine to perform both tasks by directing some of the air to the skirt, the rest of the air passing out of the back to push the craft forward. The SR.N1 was powered by a single piston engine, driven by expelled air. Demonstrated at the Farnborough Airshow in 1960 it was shown that this simple craft could carry a load of up to 12 marines with their equipment as well as the pilot and co-pilot with only a slight reduction in hover height proportional to the load carried. The SR.N1 did not have any skirt, using instead the peripheral air principle that Christopher had patented. It was later found that the craft’s hover height was improved by the addition of a skirt of flexible fabric or rubber around the hovering surface to contain the air. The skirt was an independent invention made by a Royal Navy officer, C.H. Latimer-Needham, who sold his idea to Westland (by then the parent of Saunders-Roe’s helicopter and hovercraft interests), and who worked with Christopher to develop the idea further. Operations by Hovertravel commenced on 24 July 1965, using the SR.N6, which carried 38 passengers. Two 98 seat AP1-88hovercraft were introduced on this route in 1983, and in 2007, these were joined by the first 130-seat BHT130 craft. The AP1-88 and the BHT130 were notable as they were largely built by Hoverwork using shipbuilding techniques and materials (i.e. welded aluminium structure and diesel engines) rather than the aircraft techniques used to build the earlier craft built by Saunders-Roe-British Hovercraft Corporation. Over 20 million passengers had used the service as of 2004 – the service is still operating (as of 2018) and is by far the longest, continuously operated hovercraft service. The commercial success of hovercraft suffered from rapid rises in fuel prices during the late 1960s and 1970s, following conflict in the Middle East. Alternative over-water vehicles, such as wave-piercing catamarans (marketed as the SeaCat in the UK until 2005), use less fuel and can perform most of the hovercraft’s marine tasks. Although developed elsewhere in the world for both civil and military purposes, except for the Solent Ryde to Southsea crossing, hovercraft disappeared from the coastline of Britain until a range of Griffon Hovercraft were bought by the Royal National Lifeboat Institution. In Finland, small hovercraft are widely used in maritime rescue and during the rasputitsa (“mud season”) as archipelago liaison vehicles. In England, hovercraft of the Burnham-on-Sea Area Rescue Boat (BARB) are used to rescue people from thick mud in Bridgwater Bay. Avon Fire and Rescue Service became the first Local Authority fire service in the UK to operate a hovercraft. It is used to rescue people from thick mud in the Weston-super-Mare area and during times of inland flooding. A Griffon rescue Hovercraft has been in use for a number of years with the Airport Fire Service at Dundee Airport in Scotland. It is used in the event of an aircraft ditching in the Tay estuary. Numerous fire departments around the U.S./Canadian Great Lakes operate hovercraft for water and ice rescues, often of ice fisherman stranded when ice breaks off from shore. The Canadian Coast Guard uses hovercraft to break light ice. In October 2008, The Red Cross commenced a flood-rescue service hovercraft based in Inverness, Scotland.Gloucestershire Fire and Rescue Service received two flood-rescue hovercraft donated by Severn Trent Water following the 2007 UK floods. Since 2006, hovercraft have been used in aid in Madagascar by HoverAid, an international NGO who use the hovercraft to reach the most remote places on the island. The Scandinavian airline SAS used to charter an AP1-88 hovercraft for regular passengers between Copenhagen Airport, Denmark, and the SAS Hovercraft Terminal in Malmö, Sweden. In 2006, Kvichak Marine Industries of Seattle USA built, under license, a cargo/passenger version of the Hoverwork BHT130. Designated ‘Suna-X’, it is used as a high speed ferry for up to 47 passengers and 47,500 pounds of freight serving the remote Alaskan villages of King Cove and Cold Bay. Since the channel routes abandoned hovercraft, and pending any reintroduction on the Scottish route, the United Kingdom’s only public hovercraft service is that operated by Hovertravel between Southsea (Portsmouth) and Ryde on the Isle of Wight. The hovercraft’s inventor, Sir Christopher Cockerell, claimed late in his life that the Falklands War could have been won far more easily had the British military shown more interest in hovercraft. The Soviet Union was the world’s largest developer of military hovercraft. Their designs range from the small Czilim class ACV, comparable to the SR.N6, to the monstrous Zubr class LCAC, the world’s largest hovercraft. The Soviet Union was also one of the first nations to use a hovercraft, the Bora, as a guided missile corvette, though this craft possessed rigid, non-inflatable sides. With the fall of the Soviet Union, most Soviet military hovercraft fell into disuse and disrepair. Only recently has the modern Russian Navy begun building new classes of military hovercraft. The People’s Army Navy of China operates the Jingsah II class LCAC. This troop and equipment carrying hovercraft is roughly the Chinese equivalent of the U.S. Navy LCAC. The Hovercraft Cruising Club] supports the use of hovercraft for cruising in coastal and inland waterways, lakes and lochs. In August 2010, the Hovercraft Club of Great Britain hosted the World Hovercraft Championships at Towcester RacecourseThe World Hovercraft Championships are run under the auspices of the World Hovercraft Federation.Similar events are also held in Europe and the US. Mackace (Mackley Air Cushion Equipment), now known as Hovertrans, produced a number of successful Hoverbarges, such as the 250 ton payload “Sea Pearl”, which operated in Abu Dhabi, and the twin 160 ton payload “Yukon Princesses”, which ferried trucks across the Yukon River to aid the pipeline build. Hoverbarges are still in operation today. In 2006, Hovertrans (formed by the original managers of Mackace) launched a 330-ton payload drilling barge in the swamps of Suriname. A test track for a tracked hovercraft system was built at Earith near Cambridge, England. It ran southwest from Sutton Gault, sandwiched between the Old Bedford River and the smaller Counter Drain to the west. Careful examination of the site will still reveal traces of the concrete piers used to support the structure. The actual vehicle, RTV31, is preserved at Railworld in Peterborough and can be seen from trains, just south west of Peterborough railway station. The vehicle achieved 104 mph (167 km/h) on 7 February 1973 but the project was cancelled a week later. The project was managed by Tracked Hovercraft Ltd., with Denys Bliss as Director in the early 1970s, then axed by the Aerospace Minister, Michael Heseltine. Records of this project are available from the correspondence and papers of Sir Harry Legge-Bourke, MP at Leeds University Library.Heseltine was accused by Airey Neave and others of misleading the House of Commons when he stated that the government was still considering giving financial support to the Hovertrain, when the decision to pull the plug had already been taken by the Cabinet. After the Cambridge project was abandoned due to financial constraints, parts of the project were picked up by the engineering firm Alfred McAlpine, and abandoned in the mid-1980s. The Tracked Hovercraft project and Professor Laithwaite’s Maglev train system were contemporaneous, and there was intense competition between the two prospective British systems for funding and credibility. At the other end of the speed spectrum, the Dorfbahn Serfaus has been in continuous operation since 1985. This is an unusual underground air cushion funicular rapid transitsystem, situated in the Austrian ski resort of Serfaus. Only 1,280 m (4,200 ft) long, the line reaches a maximum speed of 25 mph (40 km/h). A similar system also exists in Narita International Airport near Tokyo, Japan. In the late 1960s and early 1970s, the U.S. Department of Transport’s Urban Mass Transit Administration funded several hovertrain projects, which were known as Tracked Air Cushion Vehicles or TACVs. They were also known as Aerotrains since one of the builders had a licence from Bertin’s Aerotrain company. Three separate projects were funded. Research and development was carried out by Rohr, Inc., Garrett AiResearch and Grumman. The UMTA built an extensive test site in Pueblo, Colorado, with different types of tracks for the different technologies used by the prototype contractors. They managed to build prototypes and do a few test runs before the funding was cut. The Marylebone Cricket Club owns a “hover cover” that it uses regularly to cover the pitch at Lord’s Cricket Ground. This device is easy and quick to move, and has no pressure points, making damage to the pitch less likely. The system is quite popular at major pitches in the UK. Lee-on-the-Solent, Hampshire, England, is the home of the Hovercraft Museum, which houses the world’s largest collection of hovercraft designs, including some of the earliest and largest. Much of the collection is housed within two retired SR.N4 hovercraft, and many hovercraft in the collection are operational. World’s Largest Civil Hovercraf The BHC SR.N4 Mk.III, at 56.4 m (185 ft) length and 310 metric tons (305 long tons) weight, can accommodate 418 passengers and 60 cars. World’s largest military hovercraft – The Russian Zubr class LCAC at 57.6 meters (188 feet) length and a maximum displacement of 535 tons. This hovercraft can transport three T-80 main battle tanks (MBT), 140 fully equipped troops, or up to 130 tons of cargo. Four have been purchased by the Greek Navy. World Hovercraft Speed Record- 137.4 km/h (85.38 mph or 74.19 knots). Bob Windt (USA) at World Hovercraft Championships, Rio Douro River, Peso de Regua, Portugal on 18 September 1995. Hovercraft land speed record – 56.25 mph (90.53 km/h or 48.88 knots). John Alford (USA) at Bonneville Salt Flats, Utah, USA on 21 September 1998. Longest continuous use – The original prototype SR.N6 Mk.I (009) was in service for over 20 years, and logged a remarkable 22,000 hours of use. It is currently on display at the Hovercraft Museum in Lee-on-the-Solent, Hampshire, England.